Axiom Corporation is incorporated in December 2007 by an Experienced Engineer. Right from the beginning of journey ‘Axiom’ is associated with several prestigious projects all over India. We are privileged to work with various 5 Star Hotel chains and Big Residential Brands. Now we are growing with an experience of more than forty Hotels and lots of Residential projects. Continuing the journey with grace of God our truthful nature and hard work supporting us to expand continuously and providing us opportunity to work with our esteemed clients. AXIOM as the name stand for Real Truth and clarity we are always trying to resemble the same in our output. Our real treasure is our Happy Clients who keep on giving us repeat business and honoring us as with their association. With in-depth knowledge of water treatment, circulation and other design aspects of all kinds of Swimming pools, Water Bodies, Fountains, Water Parks, Aquaculture , Water Treatment and Exterior Lighting. Axiom is having rich hands-on experience in hundreds of Projects in association with various International Brands. We have dedicated and experienced team of Engineers & Technicians to complete the project in specified time with excellence. We are supplying, installing and commissioning the complete range of Water Treatment (STP, WTP), Swimming pool equipment, Water Bodies, Fountains, Irrigation, Aquaculture, and Exterior Lighting and doing plumbing and civil construction for all kinds of swimming pools on Turnkey Basis. Our Principals are mostly from Europe and USA, Like Rain Bird, Aquapac, Pentair, Astral. These manufacturers are world leader with a sales turnover in excess of USD 400 million. 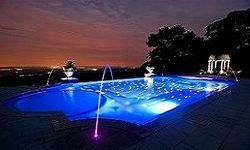 Also, as part of our continuous efforts to offer more value added services to our customers, we would be pleased to offer you our immense expertise and services in the design and detailing of the Swimming Pools and recommending the right kind of equipment and accessories for your requirement based on International Standards. Now we also deals in glass mosaic tiles i.e., in Palladio. It is an Italian company based in India. In this we do turnkey also. We have our own technician’s team.